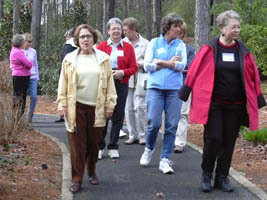 Groups of ten or more can schedule tours of the Gardens by contacting Phyllis Giles at 205.682.8019, ext. 107, or email volunteer@aldridgegardens.com. Wear comfortable walking shoes and plan on the tour lasting approximately 30 to 45 minutes. There are plenty of benches along the way, and the majority of the tour is handicapped accessible.